A dump truck driving with its bed up hit the beltway overpass Tuesday morning, damaging the bridge and causing nearly four-hour road closures on the Beltway and inbound Suitland Parkway between Md. Route 4 and Forestville Road. WASHINGTON — A bridge on the Inner Loop of the Capital Beltway will need to be repaired after a dump truck accident Tuesday morning that temporarily closed all lanes inbound Suitland Parkway between Md. Route 4 and Forestville Road and blocked two left lanes on the Beltway. A dump truck was driving with the bed up when it hit the beltway overpass around 3 a.m., damaging the bridge and causing nearly four-hour long road closures. Inspectors and engineers investigated for structural damage and determined there wasn’t a safety issue before reopening the lanes. But the bridge will need wielding repairs underneath of it, Maryland Highway Administration spokesman Charlie Gischlar said. Gischlar said the repairs will require some lane closures on both Suitland Parkway and southbound I-95, but officials will send out an alert when that will happen. The bridges on the inner loop are also in the process of being replaced as part of a long-term project that started last week and is not connected to Tuesday’s incident. Lanes inbound Suitland Parkway between Md. Route 4 and Forestville Road reopened shortly before 8 a.m. Lanes on the Beltway reopened shortly before 7 a.m.
ICYMI: Suitland Pkwy Inbound CLOSED btwn MD-4 + Forestville Rd. • I-495 Inner Loop past MD-4, 2 left lanes BLOCKED, bridge damage. 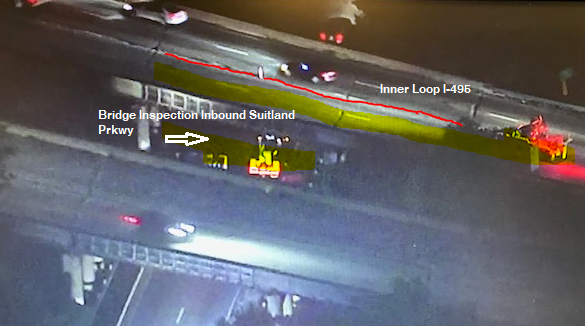 • Can access IB Suitland Prkwy from Forestville Rd. Ex. 9 OPEN. The dump truck flipped over on its side after hitting the overpass and landed on the shoulder, Lt. Simeon Klebaner of the National Park Service said. The driver was taken to the hospital for non-life threatening injuries.